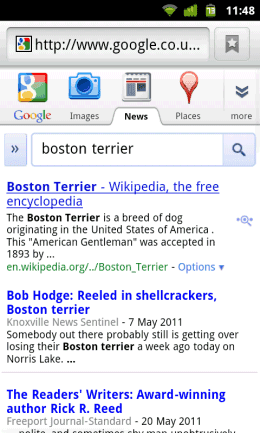 Some Google users spotted an experimental interface for Google's mobile search site. The horizontal navigation bar now includes icons, just like the vertical desktop bar. While the new interface is less streamlined, it looks more like a Web app and it makes it easier to select a different search service or a Google app. Chrome 12, the upcoming version of Google's browser which is likely to be released today, removes a useful feature: the built-in Gears plugin. While most Google services dropped support for Gears and removed offline access, Gears is still being used in Gmail. Google no longer maintains Gears, which is now legacy software, and focuses on implementing offline support using HTML5. But why remove Gears support without implementing the features using HTML5 first? Google says that you'll only need to wait for a few weeks or you can still older versions of Firefox, Internet Explorer and mail client such as Thunderbird or Outlook. "The new Gmail Offline capability is targeted for delivery as a Chrome browser web app this summer. As we move the Gmail Offline capability to a Chrome web app, we will deprecate the Google Gears-based Gmail Offline. This coincides with the version 12 release of the Google Chrome browser which no longer supports Gears. 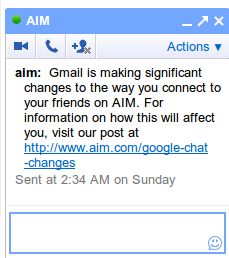 As a result, Google Gears-based Gmail Offline will no longer work with the Chrome browser as of Tuesday May 24, 2011. Google Gears-based Gmail Offline will continue to work in Internet Explorer 8 and Mozilla Firefox 3.6," explains Google. It's not the best thing to do after convincing users to switch to Chrome and use Web apps, but it's just a temporary issue. If the HTML5 offline Gmail wasn't ready to be released, removing Gears from Chrome could have been delayed. Google started to learn more about music. After improving the Web search results for music videos by adding metadata, Google added the same enhancements to Google Video. Now you can even find a list of popular albums when you search for an artist. Select one of the albums and you'll restrict the results to the songs from the album. 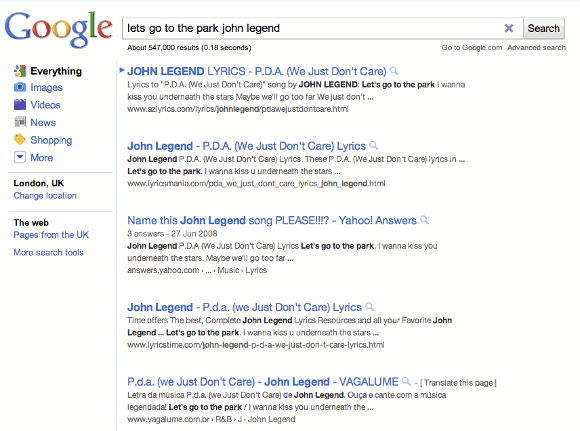 The nice thing is that Google's algorithms make sure that the results are diverse and songs aren't repeated too often. The source code of the Google Profiles page includes a broken link that has a revealing anchor text: "business profiles". The link sends you to a page that doesn't exist: http://www.google.com/_/managepages, but this feature could add Google Profiles to Google Apps and allow users to create multiple profile pages. Another interesting thing is that Google has a new subdomain: https://plusone.google.com, which redirects to Google Profiles. There's already a Web page about the +1 button, so it's not clear why Google has a new address for Google +1. Maybe profiles will be a feature of Google +1. "In The Plex", Steven Levy's recently launched book about Google, has an interesting story about GDrive, an online storage service developed by Google. People first found about GDrive from a leaked Google document, back in 2006. GDrive (or Platypus) turned out to be a service used by Google employees that offered many impressive features: syncing files, viewing files on the Web, shared spaces for collaborating on a document, offline access, local IO speeds. But Google wanted to launch GDrive for everyone. At the time , Google was about to launch a project it had been developing for more than a year, a free cloud-based storage service called GDrive. But Sundar [Pichai] had concluded that it was an artifact of the style of computing that Google was about to usher out the door. He went to Bradley Horowitz, the executive in charge of the project, and said, "I don't think we need GDrive anymore." Horowitz asked why not. "Files are so 1990," said Pichai. "I don't think we need files anymore." Horowitz was stunned. "Not need files anymore?" "Think about it," said Pichai. "You just want to get information into the cloud. When people use our Google Docs, there are no more files. You just start editing in the cloud, and there's never a file." When Pichai first proposed this concept to Google's top executives at a GPS—no files!—the reaction was, he says, "skeptical." [Linus] Upson had another characterization: "It was a withering assault." But eventually they won people over by a logical argument—that it could be done, that it was the cloudlike thing to do, that it was the Google thing to do. That was the end of GDrive: shuttered as a relic of antiquated thinking even before Google released it. The engineers working on it went to the Chrome team. 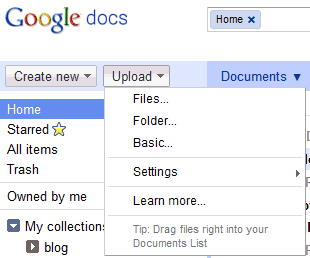 In 2009, Google Docs started to store PDF files and one year later you could store any type of file in Google Docs. The service still doesn't offer a way to sync files. Even if GDrive was never released, Google Docs inherits most of its features. The main difference is that you no longer have to worry about file formats because you can open and edit documents in Google Docs. One of the most underrated Google mobile Web apps is Google Maps. Most smartphones and tablets have a native app for Google Maps, so a mobile Web app doesn't seem necessary. Unfortunately, native apps aren't always updated frequently and there are many missing features. Google does a good job at updating Google Maps for Android, but Apple's Maps app for iOS rarely includes new Google Maps features. That's probably one of the reasons why the Google Maps mobile site was updated to include most of the features from the desktop site. Another reason is that Google wants to offer "a consistent Google Maps experience wherever you use it." The updated Google Maps mobile site has features like local business search, Google Places, driving directions, layers, My Maps, starred locations, search suggestions. If you can't find biking directions or information about businesses in the Maps app for the iPhone, you can go to maps.google.com in your mobile browser and use these features. Just like the mobile YouTube site, "Google Maps for mobile browsers is platform independent - you will always get a consistent experience and the latest features without needing to install any updates, no matter what phone you use." I've tried the updated mobile interface on an iPhone 3GS, a Nexus One and an iPad 2. While all the new features are great, the site is still too slow and unresponsive to be useful. Until Google solves performance issues and mobile browsers become more powerful, people will still use the native app. For some reason, the navigation bar displayed at the top of Google's "connected accounts" page is special. The bar has a black background and grey links. Hopefully, this is just a bug and not a redesigned navigation bar. The "connected accounts" page lets you add accounts from services like Facebook, Twitter, Linkedin, Yelp and use them to personalize search results. 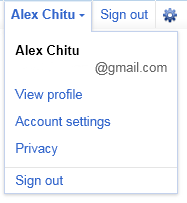 This way, you can include your accounts from other social sites without adding them to your Google Profile. 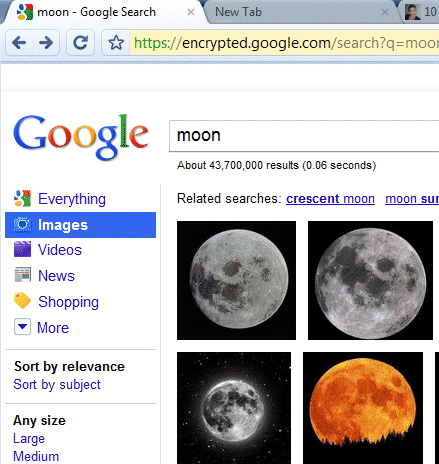 Probably the most important missing feature in Google SSL Search was image search. Now this feature is available, but there's a drawback: the page that shows a bigger image preview doesn't use SSL. Google's encrypted flavor supports most of the features of the regular Google site. The left side of the navigation bar is still missing, you can't use Google Instant and the Wonder Wheel, but hopefully these features will be added in the near future. Google Chrome has recently implemented a feature called SSL False Start which "reduces the latency of a SSL handshake by 30%". SSL sites load slower and one of the reasons is that SSL handshakes are more CPU intensive, use more network round-trips and more packets. 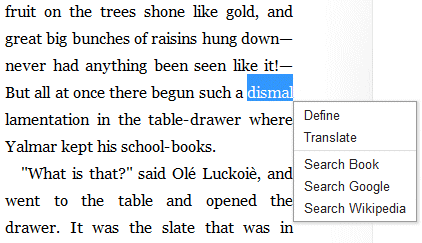 Google's eBook Reader for the Web added a contextual menu that lets you define, translate and search for a selected word or text. "To select text in a Google eBook within the Web Reader, double-click or highlight it with your mouse and a pop-up menu opens with the following options: Define, Translate, Search Book, Search Google and Search Wikipedia," explains the Google Books blog. Definitions are obtained from Google Dictionary, while translation is powered by Google Translate. 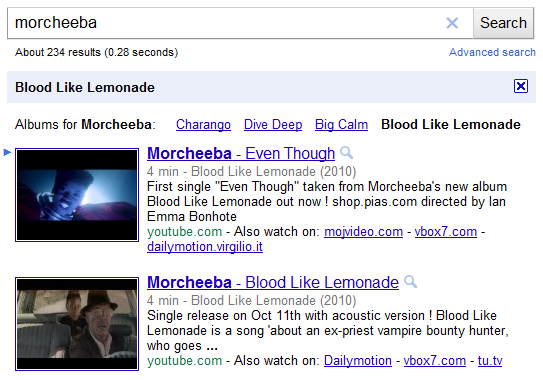 If you click "Search Book", Google shows a list of all the instances in which the selected text appears in the book. 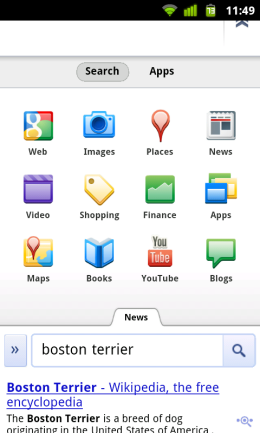 These features aren't available yet in the Google Books apps for Android and iPhone. 1. Native printing in Google Docs. You no longer have to download PDF files and use Adobe Reader or a similar PDF reader to print documents. Google implemented a W3C working draft from 2006. 2. Uploading folders in Google Docs. While you can install a Java applet in other browsers to upload folders, Chrome is the only browser that supports this feature natively. 3. Voice Input in Google Translate. The latest Chrome version supports the HTML Speech API, which provides speech recognition and input to web pages. The first Google service that supports this feature is Google Translate, but it's also tested for Google Web Search. Instead of typing your query or the text you want to translate, you can speak into your computer's microphone. 4 & 5. 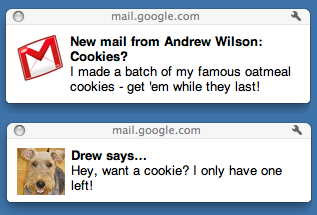 Desktop notifications in Gmail and Google Calendar. It's a really useful feature that replaces the annoying pop-up notification in Google Calendar and shows an unobtrusive notification when you receive a new message. 6. Open PDF attachments in Gmail using the built-in PDF reader, instead of Google Docs Viewer. It's not clear why Google doesn't detect Adobe Reader's plug-in to use a more full-featured PDF reader. 7. Drag and drop Gmail attachments to your desktop. Instead of clicking the "download" link, you can drag the file icon to your desktop. 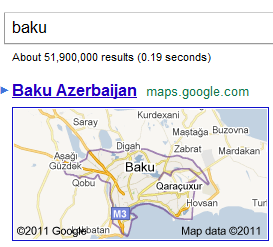 Google's OneBox displayed when you search for the name of a country, a city or a zip code got smarter. Google added an outline around the location you want to find, so the map is even more useful. 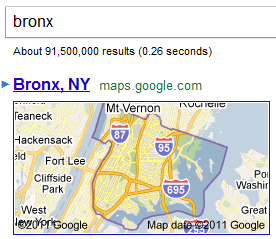 For example, try searching for [Bronx], [Detroit 48238], [Baku], [Paraguay map]. 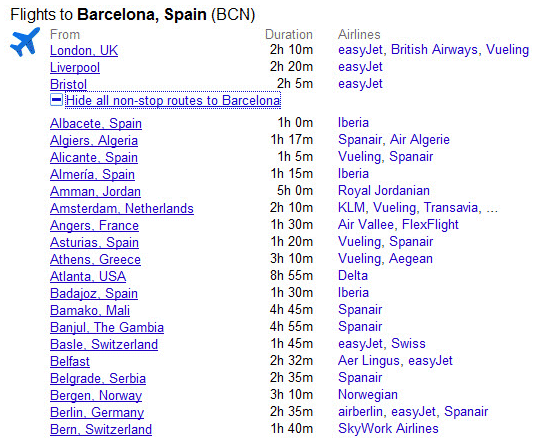 Chris, a reader of this blog, says that he used CityData before noticing the new Google feature. While CityData is only useful for the US, the Google Maps OneBox is displayed for almost any city in the world. I've previously reported about Gmail's experiments with image ads and personalized ads, but it seems that these tests are two pieces from a puzzle: a new ad-matching system for Gmail. New York Times reports that the new algorithms try to find better ads. "Alex Gawley, Google's senior product manager overseeing Gmail, (...) said Gmail's revamped ad-matching system, now in limited tests, analyzes context as well as the content of an individual message. It looks at what he calls 'signals in your inbox,' like whether you open messages with particular keywords and don't open those with other keywords." Gmail will also include static image ads. "For example, an e-mailed offer for a ski package showing a skier on the slopes could be accompanied by an ad on the right side of the screen, showing a competing offer, replete with another skier coming down another slope. Mr. Gawley said the image used in the ad would be static, not animated, and would be used only in cases where the e-mail message itself showed images." Gmail's new ads will still be related to your messages, but Google will add other signals that will make the ads an extension of your inbox. Just like Google shows small images ads next to images search results and uses your preferences to personalize ads, Gmail's contextual ads will improve using more data. As long as the ads are relevant, moderately useful and they aren't distracting, Google is still on the right track. It might take a while to get used to the image ads, but the ad displayed below the messages and the list of messages will be the most obnoxious. "Gmail presents a single text ad when you look at an inbox view and haven't selected a particular message," according to the New York Times. Google Spreadsheets added an advanced feature that's really useful for summarizing data: pivot tables. "In essence, a pivot table does just that -- it allows you to 'pivot' or rotate data, thus looking at it from different angles and seeing a variety of patterns which may not be immediately obvious," explains Google Docs blog. A pivot table is a powerful reporting tool that lets you group, filter, sort, count data. Google has an example of spreadsheet that includes information about some students, but it's not easy to summarize the data without using a pivot table. For example, you can group the students from each class level by gender. Just select "Pivot table report" from the "Data" menu, choose the categories of data to include (gender and class level) and the values to summarize ("class level" summarized by "COUNTA"). "A pivot table report is a dynamic table that lets you interpret data in different ways without ever having to enter a formula. Pivot table reports are particularly useful when you want to narrow down a large data set or analyze relationships between data points," suggests Google's help center, which also includes a guide for using this feature. Google News has a redesigned interface that tries to remove the visual clutter and make multimedia content more discoverable. 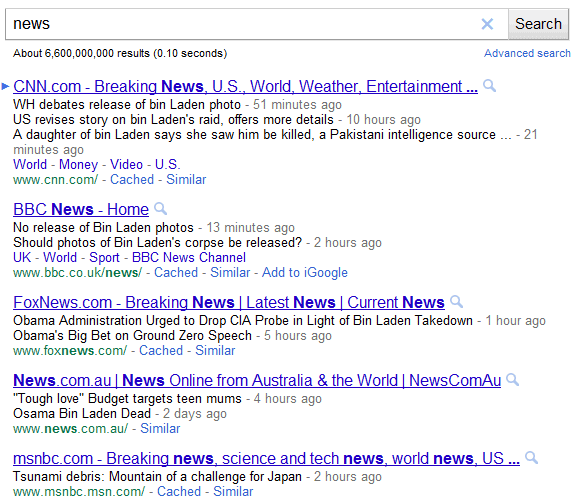 All Google News clusters are collapsed by default, except for the top news story. Clusters include more links, a special section for images and videos, but you have to manually expand them. "The newly expandable stories on Google News in the U.S., released today, give you greater story diversity with less clutter. Now you can easily see more content, see less of what you don't use and have a more streamlined experience," explains Google. 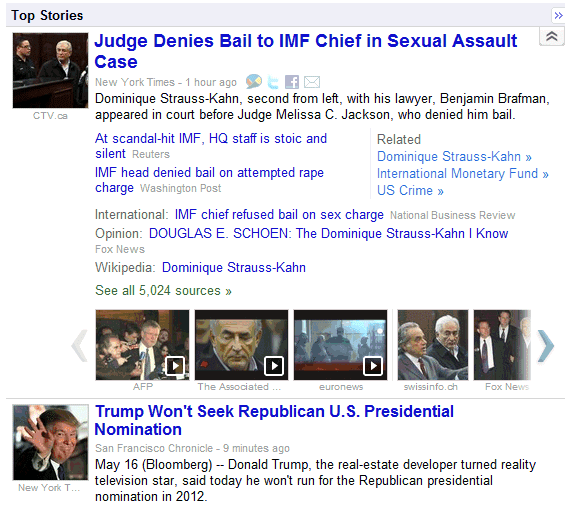 The redesigned UI shows a single news article instead of a group of related articles. Although the cluster is still available, it's strange to see that Google hides one of the main features of Google News: grouping articles about the same topic. As Krishna Bharat, the founder of Google News, has recently said, the service "groups news articles by story, thus providing visual structure and giving users access to diverse perspectives from around the world in one place". Power users can try Google's keyboard shortcuts (j/k for navigating to the next/previous story, o/u for expanding/collapsing a story), but most users will rarely expand stories and only click the main news article. 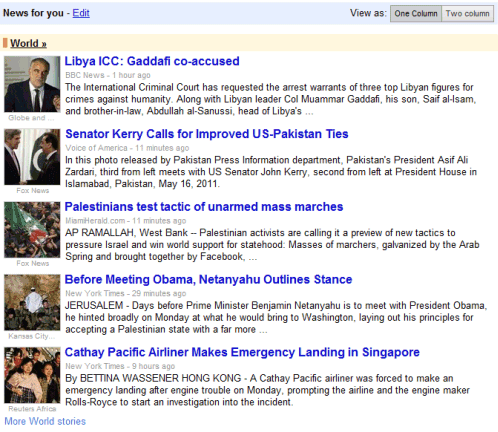 Barry Schwartz spotted some new options that let you personalize Google News. If you go to the Google News settings page, you can tweak Google News to show fewer press releases, more blog posts or even hide all the blog posts and press releases. "The neat part of the control of how you see blog and press release results is that there is a lever. You can pick from None to Fewer to Normal to More. Everyone by default is set to normal," says Barry Schwartz. 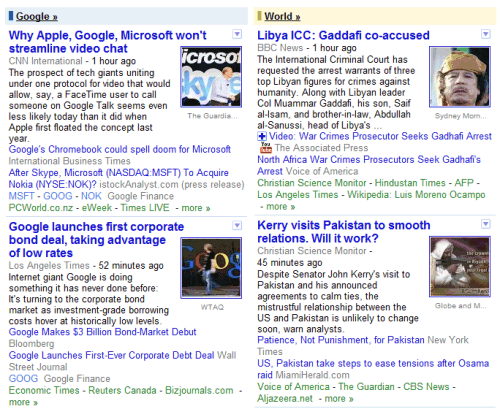 You can also disable the automatic refresh of the Google News homepage. 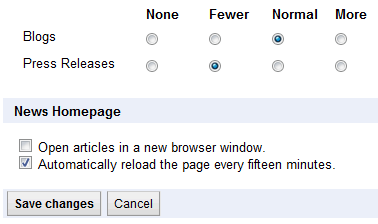 By default, Google reloads the page every 15 minutes. Last month, Google added a new search options in the sidebar: dictionary. It's a new interface for Google Dictionary that combines definitions from a reputable dictionary with definitions from the Web, usage examples and other useful information. At the same time, some users reported that Google's define: operator no longer works. The operator was useful to find definitions obtained from Web pages, so you could type [define:iffy] and find a list of definitions. Now the operator is no longer broken, but it only shows the definition from Google Dictionary and links to the dictionary page. You could type [define iffy] and get similar results. 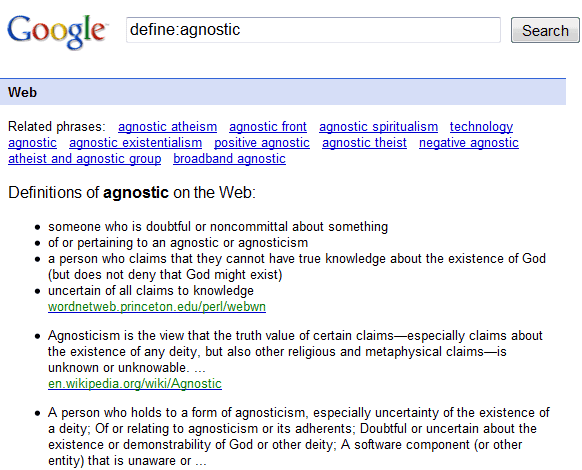 Maybe Google should send users to the dictionary page when they use the define: operator. It's an advanced feature that's not used by many people, but it's very useful. YouTube's drop down menu at the top of the page now includes a list of all your playlists and makes it easier to access your favorite videos, your liked videos and the videos added to the "Watch later" playlist. "You will now see a different set up when you click on your username in the upper right hand corner of any page. In addition to showing the same links to access your Account, My Videos, etc. you will be able to click on thumbnails to automatically load your playlists, Liked, Favorites, and Watch Later lists. The songs in your playlists will be accessible in the strip across the bottom of your screen -- so you can easily navigate to different videos in the playlist you are watching," explained a Google employee. Another way to access your playlists is to expand the small bar displayed at the bottom of the page, click "Options" and select "Load a different playlist". Google created a new Web page that explains users why it's a good idea to create a Google account. "One name, one password. That's all you need. Its free. Take a look at how you can personalize and optimize your experience across all Google products and services." Using a Google account, you can share photos, track your favorite stocks, get more storage for your email, share your schedule, create web pages and collaborate on documents, make free phone calls and chat face to face, get personalized search results and personalized news, create custom maps and get the same experience on multiple devices. There's a lot you can do if you have a Google account. 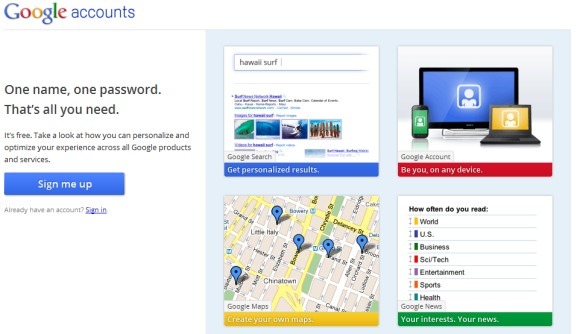 While most of the new Google services and features require an account, back in January 2005 Google didn't have many services that required authentication. 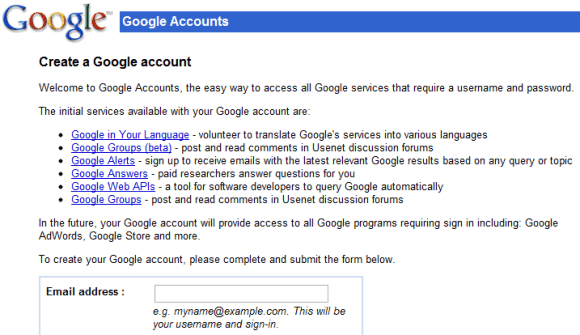 As the Wayback Machine shows, the initial services available with a Google account were Google Groups, Google Alerts, Google Answers and Google Web APIs, but Google promised that "in the future, your Google account will provide access to all Google programs requiring sign in including: Google AdWords, Google Store and more." One year later, Google already offered Froogle, Personalized Search and a Personalized Homepage and it was preparing to launch Google Calendar, Google Spreadsheets, Google Writely and to acquire YouTube. 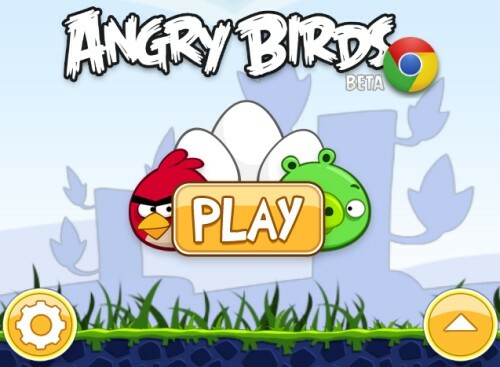 Angry Birds, the most popular game for smartphones, has a Web interface. You can install it as a Chrome app or play it from chrome.angrybirds.com using the latest versions of the most important browsers. Nelson Minar says that "calling it Chrome Angry Birds is missing the point because what's really interesting is that it's a real-time multimedia cross-platform HTML 5 app" and he's right. Angry Birds works well in Internet Explorer 9 and even in Firefox 3.6, but there are some upcoming features that will only work if you install the Chrome app: for example, in-app payments. The game caches most of the resources, so you can play it offline. Fast, simple, secure, built for the Web, doesn't require administration. It's a Chromebook, a Chrome OS notebook that will be available starting from next month. "Chromebooks will be available online June 15 in the U.S., U.K., France, Germany, Netherlands, Italy and Spain. More countries will follow in the coming months. In the U.S., Chromebooks will be available from Amazon and Best Buy and internationally from leading retailers," informs Google. Google's simplified computing model puts the browser at the core and creates an operating system that revolves around Google Chrome. Samsung and Acer are the launch partners. Samsung's notebooks have 12.1" displays, Atom Dual-Core processors, 16 GB solid state drives, weigh 1.48 kg and get 8.5 hours of continuous usage. They're similar to the Acer notebooks, which have 11.6" displays, a higher resolution, but only get 6 hours of usage. Some of the notebooks include 3G support, while other notebooks are Wi-Fi only. 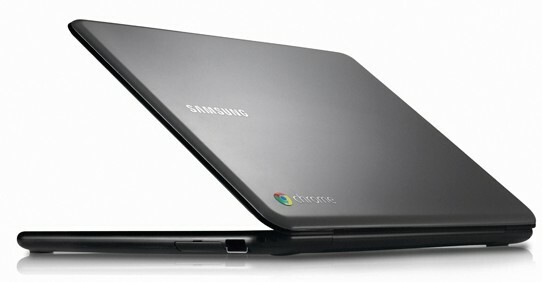 "The Samsung Chromebook will cost $429 in the U.S. for the Wi-Fi only version and $499 for the 3G version. Acer's Wi-Fi only Chromebook will cost $349," reports CNet. While Chromebooks don't require administration, businesses and schools need a way to manage hundreds or thousands of notebooks, so Google decided to offer a service that includes a cloud management console, support, device warranties and regular hardware refreshes for only $20/user (schools) or $28/user (businesses). Chromebooks are actually the real netbooks, lightweight and inexpensive computers built for simple tasks like browsing the Web. Unfortunately, netbooks are no longer very popular and users replace them with tablets like the iPad, which have better displays, better battery and are easier to use. For now, Chromebooks will compete with Windows netbooks and it won't be easy to convince people to buy a Chrome netbook when they could run Chrome on a regular netbook. The good news is that Chromebooks will force Google to improve its web applications, to offer more advanced features, more free storage and all Google users will benefit even if they don't buy a Chromebook. Just when you thought that Google Tasks was abandoned, Google releases an API for Google Tasks. "The Google Tasks API provides developers with a powerful set of API endpoints for searching, reading, and updating Google Tasks content and metadata." Developers will be able to create applications for mobile devices, software that integrates Google Tasks with Outlook and other apps using an official API and a proper authentication mechanism. Google Tasks has a lot to improve before becoming as powerful as Remember the Milk and it's surprising that the missing features aren't added faster. In January, Google listed some of the most common feature requests: repeating tasks, notifications, task sharing, tasks API, synchronization, visual distinction for overdue tasks. 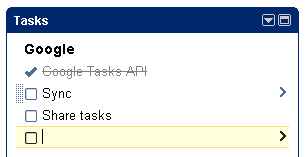 The Tasks API is the first feature that's now available. Google I/O's first keynote was all about Android and there were many impressive announcements. Android stats continue to be surprising: 100 million activated Android devices, 400,000 Android devices activated every day, 200,000 apps in the Android Market, 4.5 billion apps downloaded from the Android Market, 310 Android devices. 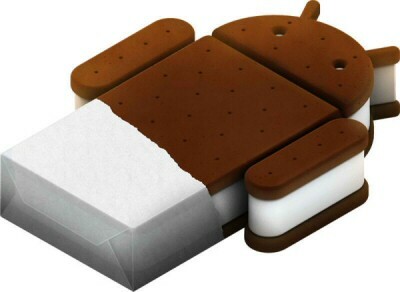 The next major Android release is called Ice Cream Sandwich and the goal is to create a unified operating system that runs on phones, tablets and TVs. Ice Cream Sandwich will be released later this year, but there's a Honeycomb 3.1 update that adds support for USB accessories and for Google TV. This summer, people who bought Google TV devices will be able to install Android 3.1 and run apps from the Android Market. Android users from the US can now rent movies from the Android Market. 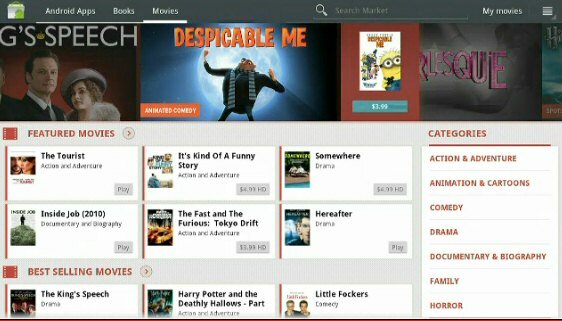 "You can choose to rent from thousands of movies starting at $1.99 and have them available across your Android devices — rent a movie on your home computer, and it'll be available for viewing on your tablet or phone. You can rent from Android Market on the web today, and we'll be rolling out an update to Verizon XOOM customers beginning today. We'll start rolling out the update to Android 2.2 and above devices in the coming weeks," informs Google. There's no music subscription service, but Google launched an invitation-only service that stores all your music on Google's servers and lets you stream it from almost any computer and Android device. iPhone/iPod/iPad users can install the latest software updates for at least two years, but that's not always the case when it comes to Android devices. Some Android phones run outdated software at launch and not all of them are updated to the latest version because phone manufacturers and carriers don't think that's really important. Google and some of the other members of the Open Handset Alliance (Verizon, HTC, Samsung, Sprint, Sony Ericsson, LG, T-Mobile, Vodafone, Motorola and AT&T) started to develop some guidelines for updating firmware. "To start, we're jointly announcing that new devices from participating partners will receive the latest Android platform upgrades for 18 months after the device is first released, as long as the hardware allows," informs Google. Google also developed Android Open Accessory, "which allows external USB hardware (an Android USB accessory) to interact with an Android-powered device in a special accessory mode. (...) Many previously released Android-powered devices are only capable of acting as a USB device and cannot initiate connections with external USB devices. Android Open Accessory support overcomes this limitation and allows you to build accessories that can interact with an assortment of Android-powered devices by allowing the accessory initiate the connection." Probably the most interesting announcement is Android@Home, a framework that allows Android devices to communicate with home appliances and other devices. It's an ambitious project that could make home automation part of everyday life. That's also one of the main reasons why Google bought Android: bringing Google's software to new devices, finding new ways to use Google's information in everyday life, creating an ecosystem of smart devices with standard features and APIs that make "the world's information" more useful. 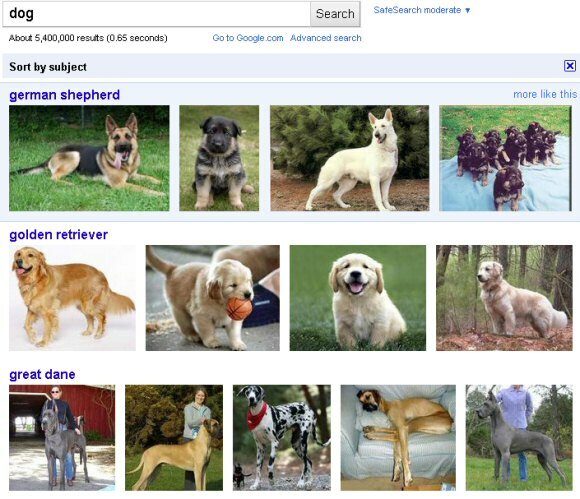 Google Image Search added a new feature that lets you group images by subject. Instead of showing images related to different topics in a single view, Google's image search engine finds the most relevant related searches and shows the top results for each category. For example, when you search for [dog], Google shows the results for [german shepherd], [golden retriever], [great dane], [pug dog], [boxer dog], [rottweiler dog], [border collie] and more. Unfortunately, the clusters for [cat] aren't that great: [funny cats], [cute cats], [cats and kittens], [fat cat], [lol cats]. 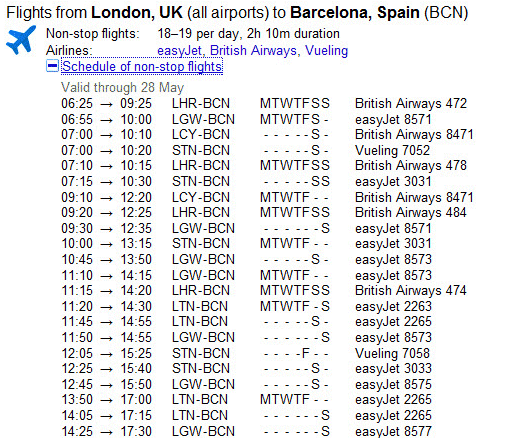 "Sorting gives you a new way to start your search by exploring categories visually. If you need a particular image, like a picture of coffee for a presentation, sorting can help you hone in on exactly what you're looking for. Searching for broad topics sorted by subject, like the 1940s or Sydney, allows you to explore and learn visually," explains Google. You only need to select "images" from the Google sidebar and click "sort by subject". 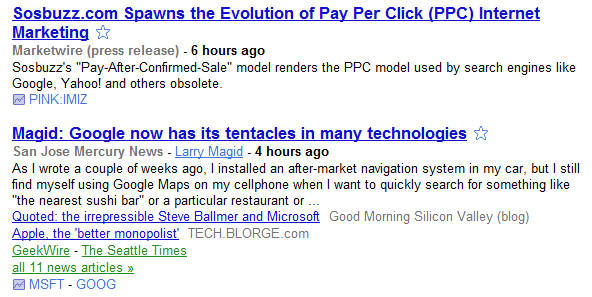 By default, Google still sorts the results by relevance. 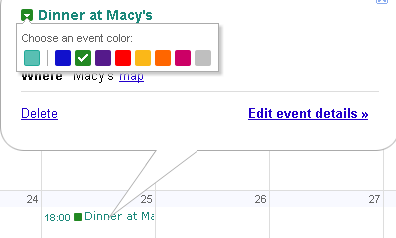 Google Calendar still doesn't offer support for labels, but you can now pick a color for each event. By default, each event inherits the calendar's color, but you can change it by clicking the event and using the small drop-down displayed next to the event's title. "Color Coded Events lets you assign specific colors to certain events: put pink on your daughter's soccer practice or make your lunch dates red. It's a great way to stay organized, keep track of recurring events, and add a little flair to your calendar. Color coding is private to you and anybody who can edit your calendar," explains Google. If you want even more options, go to Google Calendar Labs and enable "Event flair" to be able to add icons to your events. Google has a robots.txt file that lists all paths that can't be crawled by Web spiders, but there's also a humans.txt file which tries to show that Google is not all about bots and algorithms. "Google is built by a large team of engineers, designers, researchers, robots, and others in many different sites across the globe. It is updated continuously, and built with more tools and technologies than we can shake a stick at. If you'd like to help us out, see google.com/jobs." 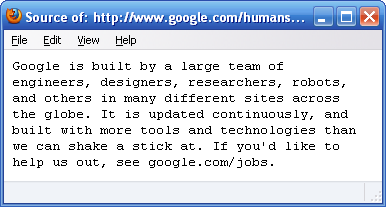 Google's Tim Bray linked to this text file and the Google Jobs Twitter account made it more popular. YouTube's robots.txt file has recently added a humorous comment: "Created in the distant future (the year 2000) after the robotic uprising of the mid 90's which wiped out all humans." 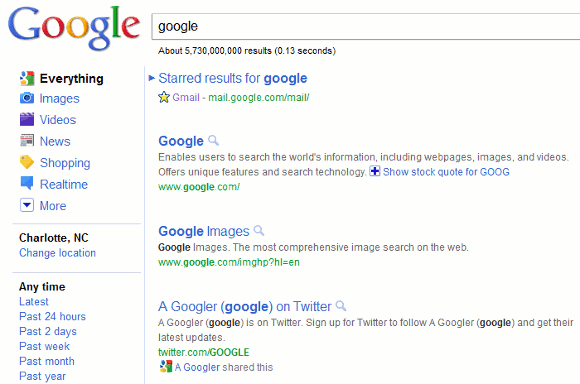 Many users noticed a new interface for Google's search results pages that tries to better separate results. 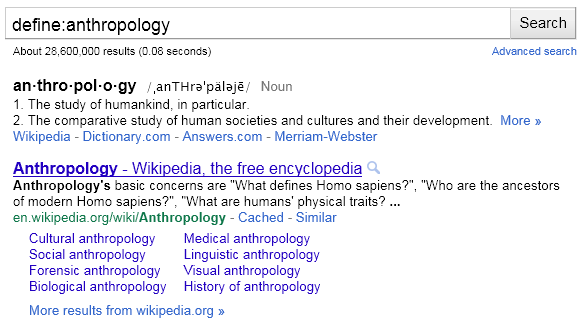 There's a lot of space between the results, but that's not useful when you try to find the best answer for your query. Huffington Post notices that "the new design looks less cluttered. Rows of text are spaced farther apart and text colors are more muted than previous versions." TechCrunch calls the new interface "ugly" and less useful because "it actually gives you much less information on the screen. This will require users to do more scrolling and paging through results to find what they're looking for." Links are no longer underlined and one of the experiments uses dotted lines to separate results. Fortunately. the new interface is still an experiment. When Google launched the new compact menus in the navigation bar, many users wondered why it's so difficult to sign out. The "sign out" link was buried in one of the menus and it wasn't obvious how to find it. Now the link is also displayed next to the Account menu, where users expected to see it. Even if it's not used that frequently, the familiar "sign out" link is displayed by most web applications and hiding it or burying it in a menu could frustrate users. Facebook is one of the services that places the "logout" link in a menu, so it's not impossible to convince users to accept this change. As previously promised, Google started to test multiple profiles for Google Chrome. It's a Chrome OS feature that's now available in Chrome's Canary builds and Chromium. Just enter about:flags in the address bar, enable "Multiple profiles" and click "Relaunch browser" at the bottom of the page. 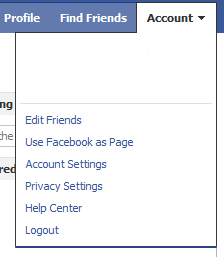 The new feature associates each window with a profile and lets you sync some of the settings with a Google account. Until now, you could create new profiles manually, but you had to use special shortcuts for each profile (Chrome has briefly added support for multiple profiles in the interface back in 2009, but it was quickly dropped). This feature is now available in the interface, even though it's more limited and you can only identify profiles using Google accounts. "The multiple profiles feature will allow the user to associate a profile with a specific set of browser windows, rather than with an entire running instance of Chrome. Allowing different windows to run as different Chrome identities means that a user can have different open windows associated with different Google accounts, and correspondingly different sets of preferences, apps, bookmarks, and so on -- all those elements which are bound to a specific user's identity. Having multiple profiles in the Chrome browser also makes it easy to browse with separate identities without having to log in as separate users at the operating system level," explains a Google Chrome design document.